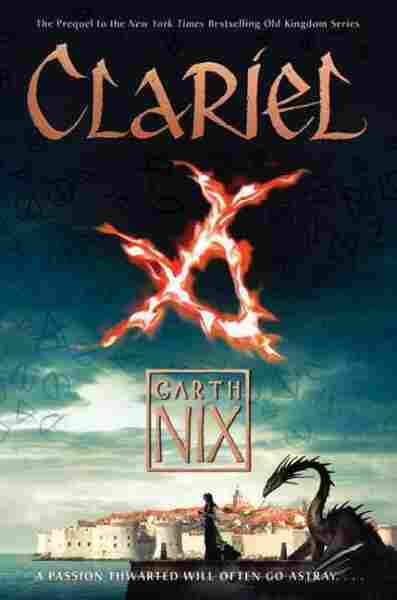 Book Review: 'Clariel,' by Garth Nix The long-awaited new novel in Garth Nix's Old Kingdom series goes back in time to follow a powerful young woman on a difficult path. Fans will get a chill when Clariel's final destiny is revealed. It is always an interesting — and sometimes fraught — endeavor for a writer of a classic, well-loved series to return to that world after decades away. Sabriel, the first volume in Garth Nix's Old Kingdom series, helped to pioneer the renaissance of YA fantasy 19 years ago. I read it as a teenager soon after its release, and its delights were both addictive and complex. I could see the echoes of genre giants like Diana Wynne Jones in his playful yet sinister mix of the modern and magical. His meticulous descriptions of necromancy reminded me of Lloyd Alexander's Chronicles of Prydain. And, of course, that mesmerizing system of charter magic, with its beautiful, chilling order, struck a chord that I had first heard in Ursula K. Le Guin's Earthsea novels. Sabriel built upon these and many other influences, but felt delightfully fresh, something I hadn't known I wanted until I read it. The market, the genre and the audience have indisputably changed in the intervening two decades. The unfortunate flip side to having written a widely loved and influential series (Abhorsen, the last full novel in this universe, was published in 2003) is that those very innovations can start to smell overdone as a generation of writers who have grown up with the work build upon it in their turn. Reading the much-anticipated Clariel, I felt transported back to that time of first discovery, of pure delight in reading something beautifully done in my genre first love. And yet I also couldn't shake an occasional sense of overfamiliarity, of certain plot and world-building elements having gone just slightly stale. Part of this rests in Clariel's placement in that often-awkward category of prequel. The novel takes place 600 years before the events of Sabriel, and explains a great deal about the development of that mix of magic and modernity, separated by an ancient wall. For a true Nix fan, this window into the creation of one of the great worlds of modern fantasy is full of hidden treasures. For a more casual reader, unfortunately, the quasi-renaissance technology and fantasy set pieces may make it easy to overlook the many ways in which Clariel's world and her story are truly distinct. Clariel recounts a hero's journey gone catastrophically wrong. The refrain from all the Abhorsen novels seems particularly apt here: "Does the walker choose the path, or the path the walker?" Because Clariel's fundamental problem is exactly that: no one will let her choose. Everyone wants to use her for something, from her politically powerful goldsmith parents, to the king and even the Abhorsen himself — the famous necromancer who protects the realm. Clariel has a value in their eyes as a woman of noble birth, or as one of the rare people with the power of berserker rage, but no one ever values her own desires. "What she desperately wanted to do was get out of the city and ... purchase a hunting lodge or forester's hut outside Estwael, to go hunting and fishing and just live in the quiet, cool, shaded world of the forest valleys and the heather-clad hills that she loved." But while Clariel spends the novel dreaming of her home forest, she never sees it. That longing and that frustration at being manipulated and ignored and enclosed over and over again drives her down a path that gets very dark indeed. This novel is easily understood on its own, but fans of the series will get a particularly chilling reward when it becomes clear who Clariel grows into. These are the moments when Nix's command of the genre is clear and thrilling. He understands the darkness that is part of every hero's journey, that at some point along her path her greatest enemy will be herself. So many great fantasy narratives play with the temptation of power and anger — generally, so that the hero can overcome them. But what if she doesn't? What if she says yes? I suspect that newcomers won't find this as immediately gripping a read as Sabriel — largely because without context it loses so much resonance — but for Nix's many fans, this will be a welcome return across the wall. Alaya Dawn Johnson's latest book is called Love Is the Drug.